It’s officially summertime…and that means people will be on-the-go, entertaining at home and having fun in the sun! 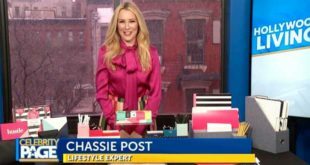 Lifestyle Expert Justine Santaniello partnered with brands to showcase her summer must-haves to carry you through the season with ease! Did you know that 43% of makeup brush users say they never wash their makeup brushes? This innovative product is a must-have for your summer beauty routine! The first of its kind to be sold at mass retailers, the cloths provide a simple, daily cleanse for regular makeup brush use immediately after makeup application to remove daily dirt and impurities. Designed for weekly deep cleansing, the shampoo is gentle and safe for use on makeup brushes without damaging the integrity of the brush bristles. Both products are dermatologist-tested, cruelty-free and made with plant-based ingredients free of parabens, phthalates and oils. Available for purchase at retailers nationwide or on www.ecotools.com. For more information, visit www.ecotools.com. The change in the season along with summer’s heat and humidity can take a toll on your hair. You’ll want to have this summer hair care essential on hand! Head & Shoulders Nourishing Shampoo and Conditioner is designed to relieve dandruff and its associated symptoms while providing cleansing and moisturizing benefits, giving you the beautifully nourished hair you want and the scalp care you need. The formula combines proprietary scalp technology with a unique blend of naturally-derived, nourishing ingredients including guar bean, cotton seed and soft wood extracts. Available for purchase at the Head & Shoulders website and mass market retailers. For more information, visit www.HeadandShoulders.com. We’re spending so much time outdoors, it’s important to protect yourself from pests. Here’s a great way to repel mosquitoes! OFF!® FamilyCare Smooth & Dry Aerosol Spray uses an advanced powder-dry formula that dries on contact, leaving skin feeling smooth and dry, not oily or greasy. It repels biting flies, gnats, ticks, chiggers and fleas as well as mosquitoes that may carry the Zika, Dengue and West Nile viruses. OFF! Deep Woods® Aerosol Spray provides long-lasting protection against mosquitoes, ticks, biting flies, gnats and chiggers. It repels mosquitoes that may carry the Zika, Dengue and West Nile viruses. Available for purchase at mass retailers nationally, food retailers nationally, drug retailers nationally, Family Dollar, Dollar General, Home Depot and Lowes. For more information, visit www.off.com. When it gets too hot and it’s time to head indoors, make sure you’re breathing cleaner air with this high-tech air purifier! The Winix HR1000 Air Purifier combines advanced air cleaning technologies with user centric elegant design, to create an elite member of the Winix family; best used in any area of the home. Sporting a 5-Stage air purification system with Washable Pre-Filter, Coated Deodorization (CD) Carbon Filter, Anti-microbial True HEPA Filter and WINIX PlasmaWave® Technology. The HR1000 is Winix’s premier Wi-Fi enabled product; compatible with the Winix Smart app. Available for purchase at www.homedepot.com. For more information, visit www.winixamerica.com. Keep the bugs out of your house this summer…check this out! This easy-to-use spray leaves no lingering chemical odor and ensures coverage of the areas ants, roaches and other listed bugs may be infesting. It kills on contact and keeps killing roaches with residual action for up to four weeks. Available for purchase at mass retailers nationally, food retailers nationally, drug retailers nationally, Home Depot, Lowes, Family Dollar and Dollar General. For more information, visit www.raidkillsbugs.com. * Content Provided and Sponsored by EcoTools, Head & Shoulders, OFF!®, Winix and Raid®.